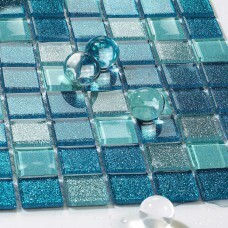 Crystal glass tiles, which can be see through so it gets the name as "crystal", but with the color paints on the back of the mosaic tiles makes thousands of colors are possible. 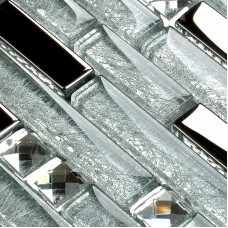 They are made of crystal clear glass and come in a variety of patterns, styles and colors. 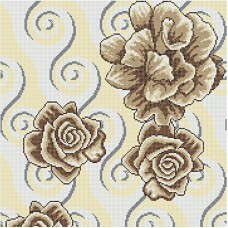 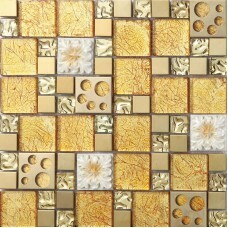 Also they can be squared, subway, round and interlocking patterns and the general thickness are 4mm, 6mm, 8mm. 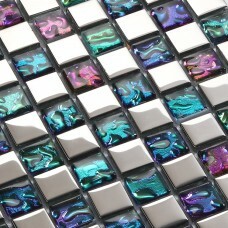 Crystal glass tiles are the most widespread mosaic tiles in common use and are used in great numbers by builders and designers for common tasks such as shower bases and swimming pool edging, but these useful mini mosaic tiles can readily be adapted for artistic craftwork, these tiles went through high temperature kiln during production, so the colors will never fade away. 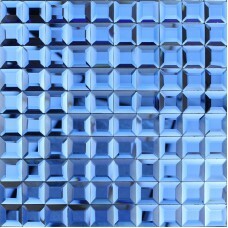 They are usually supplied on a baking sheet of light fabric mesh, from which they are easily detached with warm water. 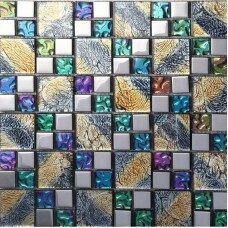 Nowadays, more and more new crafts added in, such as inner crackle, wave backing, gold foil backing, hand printing backing, making the tiles look terrific. 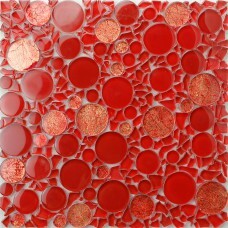 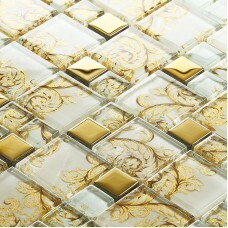 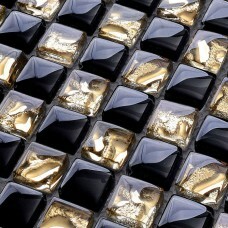 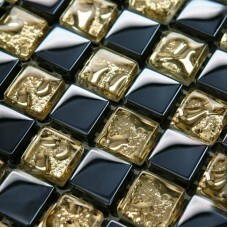 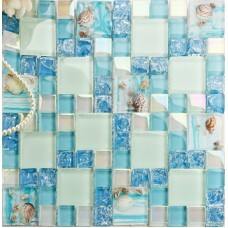 Crystal glass tiles are extremely durable and almost totally stain resistant. 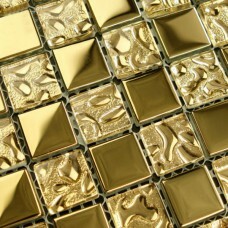 Crystal glass tiles are often used for special effects, wherever light plays an important role, similar to stained glass mosaic tiles. 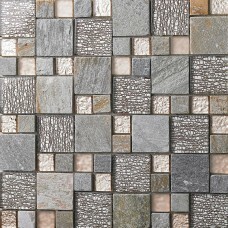 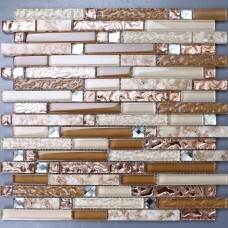 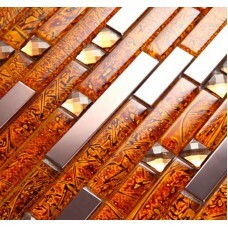 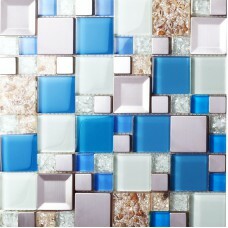 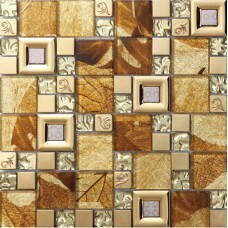 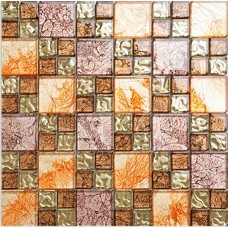 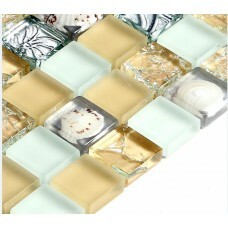 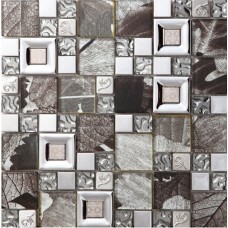 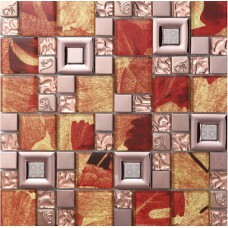 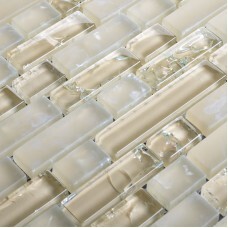 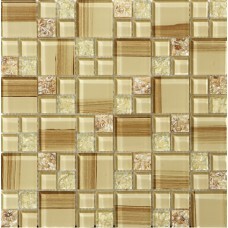 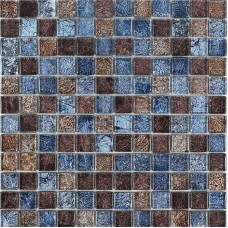 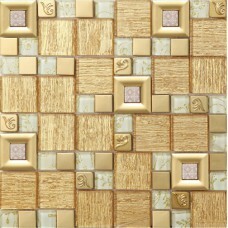 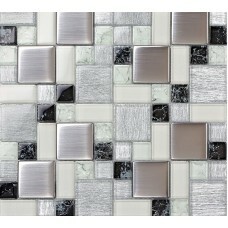 They are highly recommended for kitchen backsplash, bathroom wall, mirror deco, shower wall floor, fireplace. 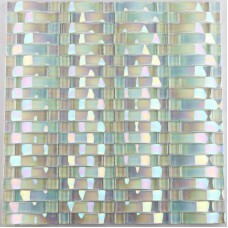 Sheet size: 300x300mm, Thickness: 6mm, Collection:Glass Mosaic Tiles, This mosaic tile is mesh mounted on high quality fiber glass, easy installation of any mosaic tile.. 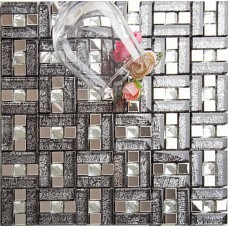 Crystal glass mosaic sheet wall stickers kitchen backsplash tile wall art designs bathroom shower mosaic floor tilesSheet Size: 300x300mmChip Size: 23x23mmThickness:..
Sheet Size: 300x300mmChip Size: 23x23mm, 48x48mmThickness: 6mmShape: SquareUsage: Backsplash & WallColor: MixedSold by: SheetFinish: SatinStyle: CraftsmanMosaic Pattern:.. 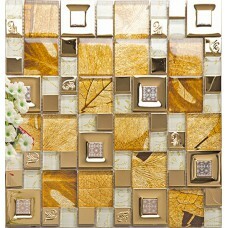 This stone mosaic is mesh mounted on high quality fiber glass, easy installation of any mosaic tile projects. 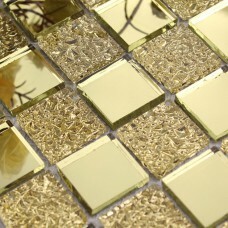 The crystal glass tile has a zero water absorption rate, and..
Sheet Size: 300x300mmChip Size: 15x23mm, 15x48mm, 15x73mmThickness: 8mmShape: StripUsage: Backsplash & WallColor: YellowSold by: SheetFinish: Crackle and FrostedStyle:.. 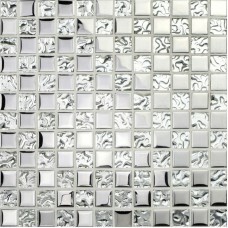 Crystal glass mosaic tiles sheet art wall stickers kitchen tv backsplash design bathroom shower floor washing room mirrorSheet Size: 300x300mmChip Size: 23x23mmThickness:..
Chip size:15mmx15mm, Sheet size:304mmx304mm, Thickness:6mm, Collection:glass mosaic tiles, Application:kitchen backsplash, bathroom, shower, Surface Finish:glossy, easy for..
Crackle crystal glass silver plated glass mosaic designs kitchen backsplash tiles bathroom wall shower tileSheet Size: 298x298mmChip Size: 23x23mm, 23x48mm, 48x48mmThickness:..
Sheet size:300 x 300mm, Thickness:6mm, Collection:glass mosaic tiles, Application:kitchen backsplash, bathroom, shower, Surface Finish:glossy, easy for cleaning, Tile Type:mosaic,.. 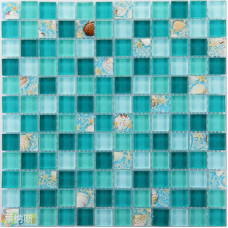 Crystal glass tiles sheet colors art wall stickers kitchen backsplash tile design bathroom shower floor bedroom washroomSheet Size: 300x300mmChip Size: 30x30mmThickness: 6mmShape:..
Sheet size:300mmx300mm, Thickness:8mm, Collection:glass mosaic tiles, Application:kitchen backsplash, bathroom, shower, Surface Finish:glossy, easy for cleaning, Tile Type:glass..
Sheet size:12" x 12" (300 x 300mm), Thickness:8mm, Collection:shell glass blend, Application:kitchen backsplash, bathroom, shower, Surface Finish:glossy, easy for cleaning, Tile..
Sheet size:300x300mm, Thickness:8mm, Collection:Glass Mosaic Tiles, This mosaic tile is mesh mounted on high quality fiber glass, easy installation of any mosaic tile projects.The..